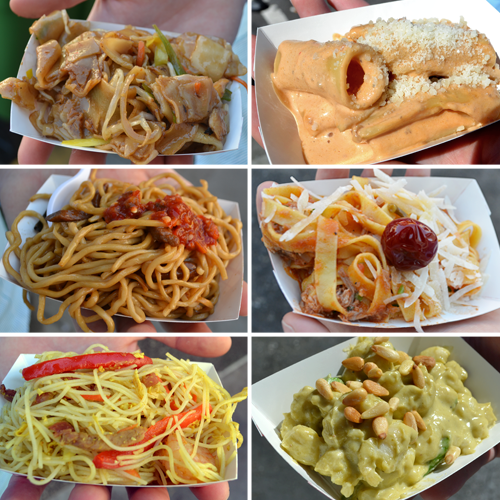 With 2011 as its second year, the Chinatown and North Beach Noodle Fest is pretty new as far as SF festivals go. It has special appeal to me and Nick though, because it is a bridging of Chinese and Italian cultures (like our marriage). For a $20 ticket, you get a beverage sample and 3 food samples from each neighborhood. The samples are decently-sized—as shown below—and the ticket will probably get you enough food for a light meal. Some people complain that the price of tickets is steep relative to the cost of a large plate of noodles at a Chinese restaurant, but I don't think they realize that this is a charity event with proceeds going to the Chinatown Community Development Center and the North Beach Merchants Association. It was interesting to see how each neighborhood went about organizing their part of the event. The Chinatown side had a good variety of very simple Asian noodle dishes available, with booths manned by students and volunteers from the community and a free hot tea tasting booth. On the North Beach side, it seemed like there was a much stronger presence of restaurant proprietors, many booths were decorated with fresh produce or jarred things for sale, and the dishes had more complex flavors like truffle oil and wild boar. Everything tasted yummy and very fresh for a street fair. My favorite was the prosciutto and truffle pasta from È Tutto Qua; despite it being the least pretty, the rich truffle flavor made it the most delicious. Nick was hoping to see some sort of well-choreographed West Side Story dance-fight take place between the two neighborhoods but no such thing occurred. This blog is about doing what makes you feel youthful, finding delight in wherever it is you live, and becoming a pro at being awesome. All content, artwork, and blog decor—unless otherwise attributed—is the property of this blog's author. Please give credit where credit is due. For more information about this blog and its policies, visit the FAQs page.